Get the word out: preorder now, pick up at Prerelease, and get a Standard-and-Commander-legal rare not found in booster packs. With Dominaria, WPN members are eligible to sell advance booster boxes in quantities equal to the number of Buy-a-Box promos they receive: 20 for Core, 40 for Advanced, 60 for Advanced Plus. The extra product is available now through your Prerelease distributor. And that promo? You can't get it in a booster pack. It's only available at WPN locations. We've got marketing materials specific to this promotion available on our resources page now, including a high-quality copy of the Buy-a-Box card, plus some posters to use in-store. How do I get advance booster boxes? 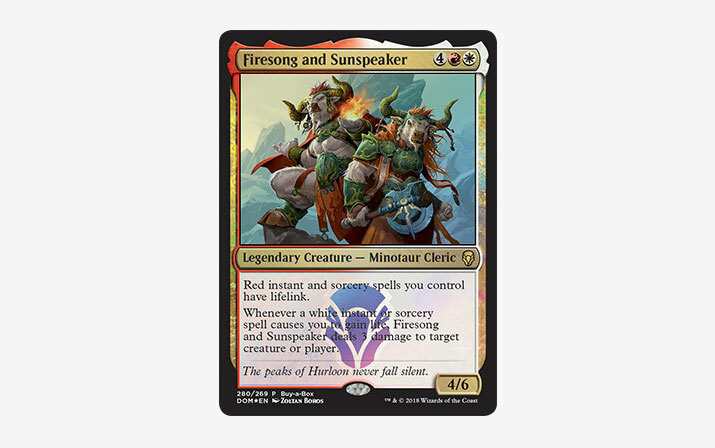 Does this change Dominaria's on sale date? Dominaria's on sale date remains April 27, but this promotion allows players to buy it early when they preorder a box from a WPN location and pick it up during Prerelease weekend. Sell advance booster boxes during Prerelease weekend*. Can players buy more than one box? Yes, and they can earn a copy of Firesong and Sunspeaker for each box they preorder. There are no limits of any kind. This promotion only lasts as long as your Buy-a-Box promos do, so encourage players to preorder early. Contact your Prerelease distributor to order your advance booster boxes today!